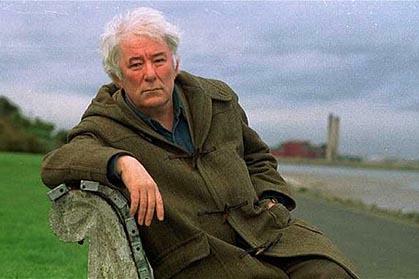 Irish poet Seamus Heaney died 30 August 2013, at age 74. His funeral was 2 September 2013, in Dublin, followed by burial in his native County Derry in Northern Ireland. Heaney won the Nobel Prize in Literature in 1995. My wife and I have this memory of Heaney from our May/June 2012 trip to Ireland: We had spent the afternoon visiting with family in Dublin, enjoying lunch at the Gresham Hotel on O’Connell Street. In the evening we took the Dublin Literary Pub Crawl with our friends Nancy and Michael, both retired school teachers. The late May evening was dry and warm. We had a grand time. As we were driving back to Navan, about 30 miles (45 km) northwest of the capitol, Michael tuned in a rebroadcast of Marian Finucane’s RTE’s interview with Heaney on the occasion of the poet’s 70th birthday. The four of us settled into the silence of rapt attentiveness for the duration of the drive. Use this link to hear Heaney reading 11 of his poems. And to make it an even dozen, here is his poem “Digging,” from his 1966 book Death of a Naturalist. This entry was posted in Arts & Culture and tagged Seamus Heaney on September 1, 2013 by admin.